BattleHack has got to be one of the more interesting hackathons around. With a Battle Axe as the grand prize and good food provided for the entire 24-hour coding marathon, it almost doesn’t feel like a programming competition at all. 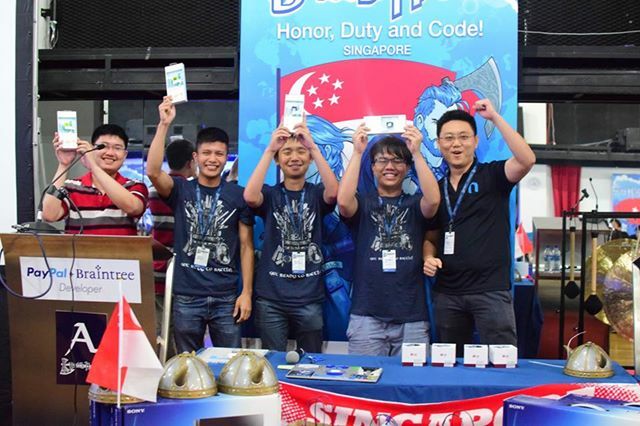 Last weekend, programmers gathered at event venue Le Danz for BattleHack’s Singapore stop. They were asked to build an app that could solve a local problem, while incorporating a payment or donation feature. Upon being presented with their task, the participating teams rolled up their sleeves and got down to work. After 24 hours of toiling, the Battle Axe trophy went to Team TalkWithMe for their SmoothTalk app. The app incorporates a custom iOS keyboard which translates the input language into a desired language in real time, addressing the issue of multilingualism in Singapore. Hoiio was there as well to lend our support as one of the event partners. Being an event partner meant that, on top of the three winners chosen by the judging panel, we could also select a winning team of our choice. Based on criteria of originality, usefulness and level of real-life application, KC chose Team FundForFun to win the Hoiio category. Using Hoiio’s IVR API, Team FundForFun created an app that allowed the elderly to call to a number and share their dreams, be it lavish or simple, which will then be submitted in the form of voice-recorded requests to the app platform. Users can then vote for their favourites and make donations through the app to fund the realisation of the old folks’ dreams. For their innovative idea, the team received a sponsored prize of FitBit Zips. Being an event partner for BattleHack is meaningful for us because by providing the API, budding coders with the passion to make a difference can build their apps more easily. Congratulations to all winning teams! To see who else won, click here.